Songs for this week are Ain't She Sweet, a Roy Smeck type chord melody with a chord on every beat and every melody note. although this arrangement takes us up the neck, it only requires a few shapes that move up and down the neck. Also, make sure you have Happy Birthday among your pocket songs. There is always someone with a birthday. Versions for high G and low G attached. As you practice Yellow Bird and Amazing Grace remember to keep a steady even rhythm (use a metronome, if you can) and try to let the melody notes ring out and be heard above the other notes in the chord. 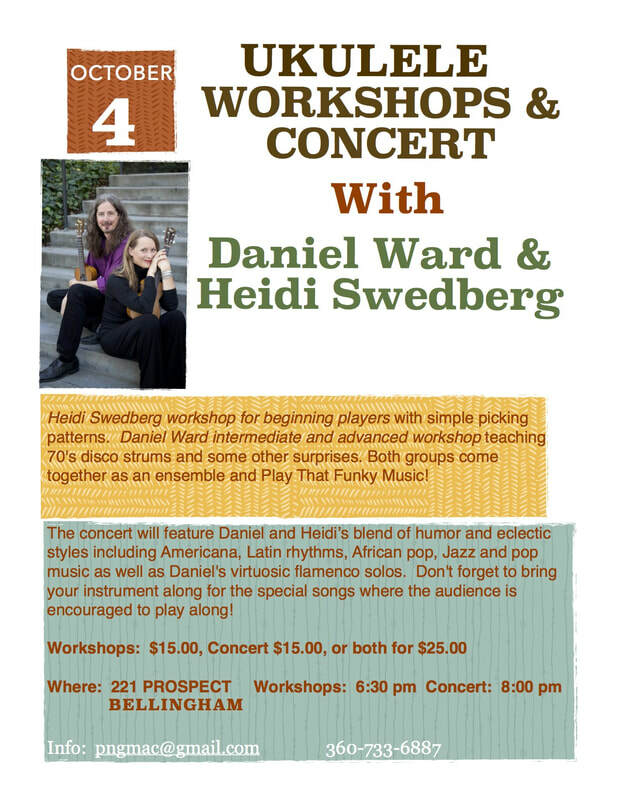 Also - Remember the Daniel Ward and Heidi Swedberg workshop and concert on October 4 - flyer is below. Register for this with me. You will certainly see some fine examples of Chord Melody playing from Daniel and Heidi is a real hoot. Playing Chord Melody is basically a technique for playing the chords and the melody at the same time. You should learn the melody and then the chords separately and then you can work on putting them together. An important part of playing chord melody is working on making the melody note be the most prominant note that you are playing. The one that is heard above all of the others. The most effective way of doing that is to make it the highest note that you play because the human ear hears higher notes better than low notes, so they stand out. To play chord melody you must get used to the idea of playing partial chords; sometimes only 2 strings. Also practice playing Frere Jacque, playing a chord with every note but do not play any strings (notes) that are above the melody note. So, you may be playing only 2 strings sometimes. Do the same with Ode to Joy. If you are doing OK with the above exercises, go ahead and work on The Cruel War. Play chords on the 1 & 3 beats and do not play any notes that are above the melody. that means that in many cases you may not need to finger the whole chord. Some of these concepts may take a while to get used to so be patient for the first week or two and it will begin to make sense. We'll start the next class answering your questions and concerns but if you are completely confused at this point and I can answer questions, please write or call me.